The Old Lychen Cemetery was once the crowning glory of the noble families that lived in the region. Hundreds of hours and thousands of coins went into producing fine mausoleums and crypts for the dead, in a futile attempt to retain glory in death. 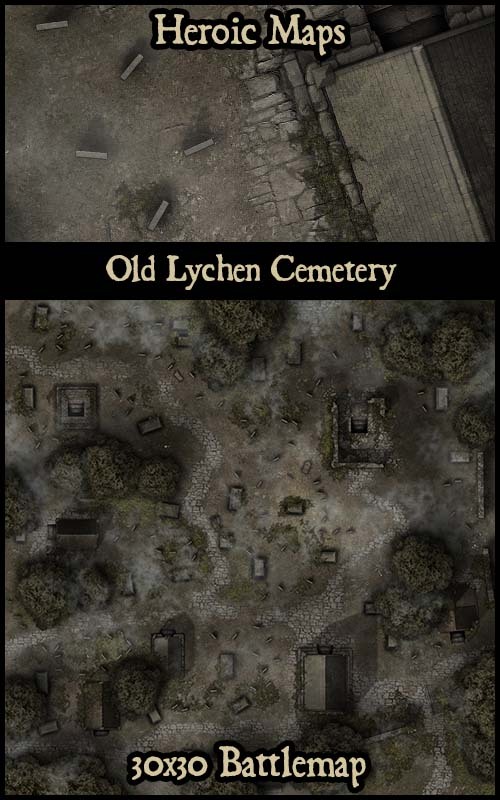 Now, the cemetery lies abandoned and overgrown, and the cemetery is now home to far less noble denizens..
Old Lychen Cemetery is a printable RPG floorplan compatible with any RPG/Dungeon-Crawl game. Use as a standalone gameboard, or combine with any same-scale tileset. Contents: A 30x30 battlemap depicting the surface. The misty graveyard is littered with overgrown tombs, gravestones and mausolea. Each one has a set of stairs descending into the darkness. GMs can pick any of the 15 Crypt maps that are included in this set when the party venture below ground, making each encounter and crypt unpredictable. The crypt maps include vampire coffins, flooded crypts, large family vaults, and more. 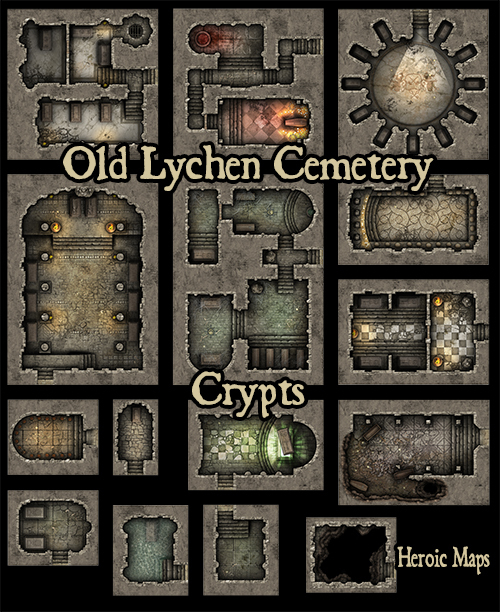 Old Lychen Cemetery forms a 30 x 30 area, with 14 cave battlemaps, and can be printed at 28mm and 25mm scale. If you're going to offer Roll20 ready maps, why aren't you offering Fantasy Grounds ready versions as well?